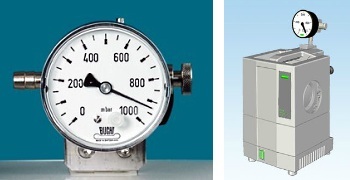 The Büchi V-700 and V-710 are chemically resistant PTFE diaphragm vacuum pumps for delivering all types of gases and vapors with totally oil free operation. 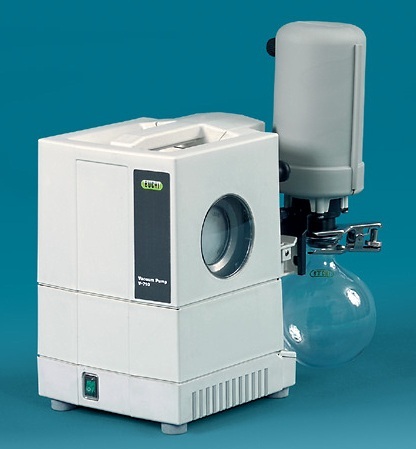 With a volume flow rate of 1.8 m3/h and a final vacuum of less than 10 mbar the Büchi V-700 covers a large range of laboratory applications and is optimally designed for use with a rotary evaporator. 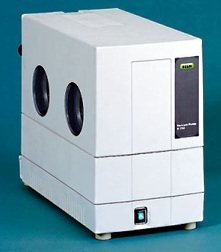 Further typical applications include the evac¬uation of drying cabinets or centrifuges and the creation of vacuum for filtration or for delivery of liquids. The Büchi V-710 three-stage, four-head pump delivers a volume flow rate of 3.1m3/h with a final vacuum of less than 2 mbar. 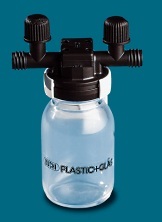 The pump can be used anywhere high suction capacity or low final vacuum is required. 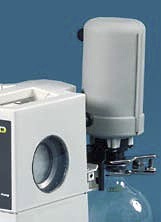 The unique window head allows for visual inspection of diaphragm making it easy to check for solvent build-up or detection of contamination. 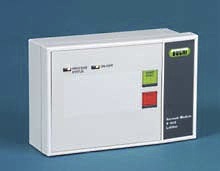 Effective safety features: the pump will only operate when the housing is closed, there is electrical surge protection with reset and an integrated operating hours meter. There are three optional methods for control. 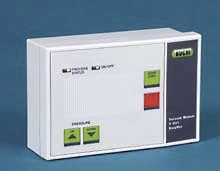 This controller regulates the pressure of the pump and has a timer function for stopping the process after a preset time. It includes simple menu control and USB interface for data transfer to a PC for storage, evaluation, and optimization. Draws air in through a fine regulation valve to set the vacuum. 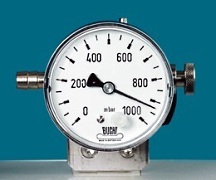 A manometer displays the pressure. A Woulff bottle is recommended and there is no data interface. 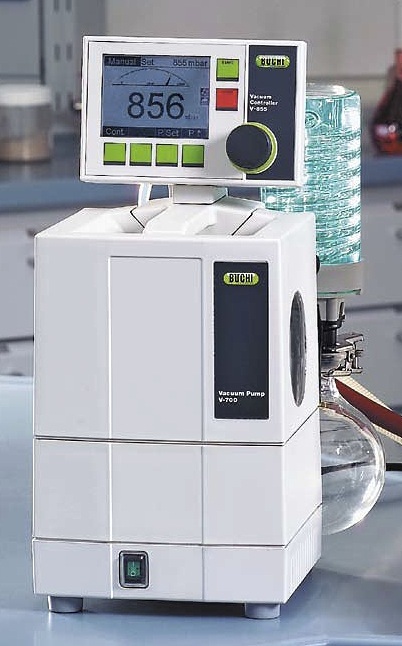 The V-855 vacuum controller: Includes the same functions as the V-850 controller along with a programming function for pressure gradients for special distillation tasks, storing up to 15 processes. 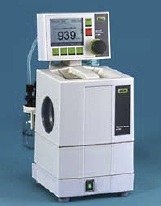 This controller also includes automatic distillation with the unique stage probe that detects the condensation limit and regulates the pressure appropriately. 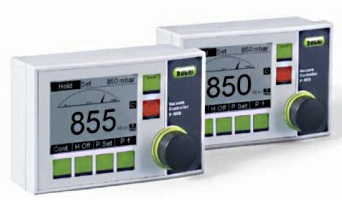 The V-855 controller features a repeat function so the pressure curve of a manual or automatic distillation can be stored and retrieved anytime as the setpoint values for optimum process conditions. This module automatically finds the distillation start point, controls the pressure to follow the vapor pressure curve, and then determines the end point of distillation using stored algorithms. 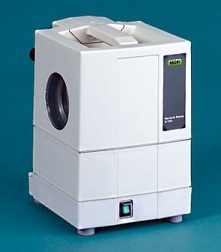 Developed specifically as a laboratory vacuum source for multiple consumers. 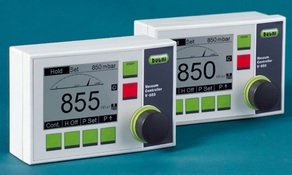 This module allows pump operation to be switched on and off to combine the provision of the required vacuum with minimum energy use. 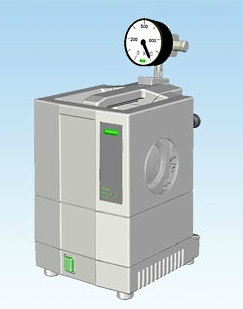 In CONT mode, the pump operates continuously to create as low a vacuum as possible, irrespective of the number of connected consumers. With a wide range of hose fittings, adapter cables for valves from other manufacturers, and connection pieces, the vacuum can be adapted to suit different systems. The compact, high-performance secondary condenser produces maximum condensation of residual solvent vapor. 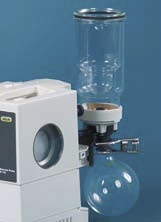 At the same time, it separates any liquid solvent from the pump, putting it directly into the receiving flask. Insulation sleeves prevent the formation of undesirable condensation and provide the condenser with effective protection against mechanical damage. The secondary cold trap is for use when dry ice is used instead of cooling water. The recommended Woulff bottle equalizes pressure and acts as a buffer vessel and condensate trap, catching particles and droplets. 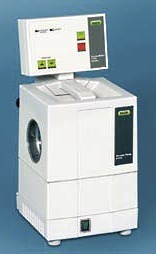 47252	 EasyVac V-801 Vacuum Module for gentle evaporation of individual solvents or complex solvent mixtures. 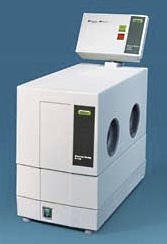 47254	 LabVac V-802 Vacuum Module for a laboratory vacuum system with several consumers. 047291	 Manual Vacuum Controller, manual setting of vacuum using a needle valve and a simple display of pressure. Recommended for use in combination with the Woulff bottle. 031356	 Cooling water valve 24V, the vacuum controller automatically opens the cooling water feed only during distillation.